A couple of nights past I had the opportunity to sit on my deck and enjoy several hours of magnificent lightning. I had my camera ready of course. That night it recieved quite a work out as I kept it clicking away constantly. 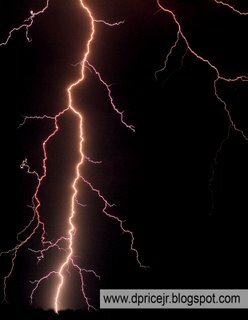 However, because of the quick nature of lightning it is virtually impossible to predict and therefore created problems for photographing. My own personal solution included a way for me to enjoy the lightning as a person while also taking pictures of it. Usually I am faced with the problem of disassociating myself with my subject and therefore never fully enjoy the actual moment. With this lightning store it was a different case. I shot from the hip that night. I also used very slow shutter speeds. By using long exposures I could point my camera toward the activity and during the 10 seconds I could sit back and enjoy the lightning. By using this method I was able to capture the photo below along with others. Hey, that is a really cool picture. Good job. That is one really cool picture... That looks like it was fun to take.